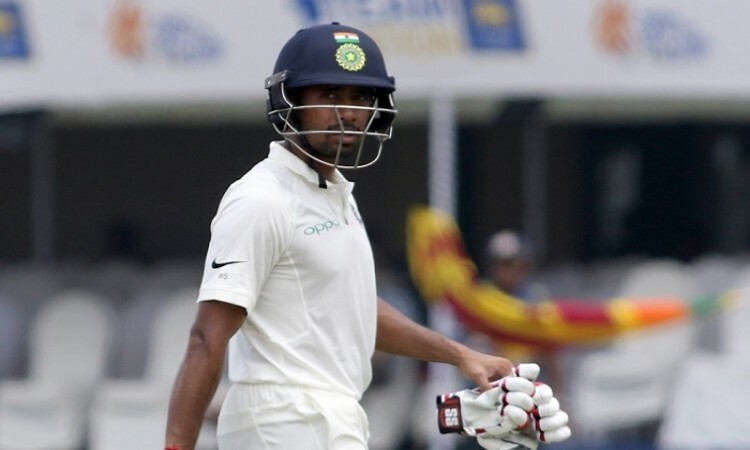 Kolkata, May 31 (CRICKETNMORE): Recuperating from a right thumb injury, India Test wicketkeeper Wriddhiman Saha on Thursday remained unsure of his participation in the one-off Test against Afghanistan next month. Saha missed the Indian Premier League (IPL) final for Sunrisers Hyderabad (SRH) due to the injury he picked up while playing the Qualifier 2 against Kolkata Knight Riders (KKR) at the Eden Gardens on May 25. India take on Afghanistan in its debut Test match from June 14 in Bengaluru where Saha is the only recognised stumper named in the squad. "The way I feel, to be honest, I might not be fit in time. Ultimately, the selectors will decide. It's not in my hands," Saha told reporters on the sidelines of the announcement of his coaching programme at the Kalighat Club. There will be three age groups (6-12 years, 13-17 years, and 17-23 years) in the programme which will have a 13-member coaching staff. A total number of 400 students will take part. "I don't know the exact situation right now, so I cannot comment on whether I would be taking part in the Afghanistan Test. The BCCI is keeping a track on my injury on a day-to-day basis. It will depend on how I recover and whether I do in time for the one-off test," he added. Saha said an operation is not on the cards at the moment as the BCCI specialist doctor will further assess his injury in a few days and only after an x-ray, will the next course of action be decided. "(Operation is) not yet confirmed. Doctor will assess again and then he will take a call. There will be an x-ray in the next few days and then it will be decided." Asked whether he would rue the fact that he won't be part of Afghanistan's first-ever Test match if he finally fails to recover in time, Saha said: "It's not only about the historic occasion. Missing a game is always disappointing." "There was a local club game for Kalighat Club against Mohun Bagan today, I could not take part in that. I am disappointed for that as well. So missing any game is disappointing." Saha had a poor IPL, managing just 122 runs in 10 innings at an average of 15.25. Quizzed about his form in front of the stumps, the 33-year-old said he could not execute what he set out for. "I could not bat the way I wanted to in the IPL. I expected to do better but that did not happen." At the Eden in the IPL Qualifier 2, Saha saw Afghanistan spin wizard Rashid Khan tie KKR batsmen in knots with stunning figures of 3/19. The 19-year-old leg-spinner had also smashed an unbeaten 10-ball 30 before that to help Sunrisers post 174/7 batting first. Rashid's whirlwind cameo and sensational bowling effort made the difference in the end as the hosts lost by 14 runs to allow Sunrisers to book a place in the final. "He is an outstanding cricketer both with bat and ball," Saha said of the world's best T20 bowler. "In the lower order especially, this season barring one or two games, he has helped the team get into a situation from where we could win games. (He is an) outstanding bowler and he will have a long career. I wish him all the best." Saha was also asked if his probable Afghanistan Test miss could be a blessing in disguise ahead of the sought-after England tour. "To me every match is important. It't not like if I miss the Afghan Test, I will do well in England as I am rested. I have to perform well in every game and that is what I am concerned about," he signed off.